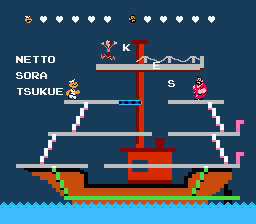 Learn basic katakana with Popeye and friends! Whee yeah hurrays! 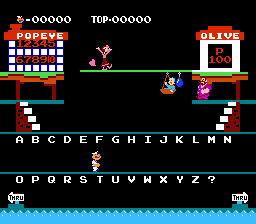 Popeye’s Lingo Game takes the ever-popular “what the hell is this katakana word supposed to actually MEAN” game and, well… turns it into a real live game. If you’re one of those (many, many, many) people that don’t know what katakana is, don’t worry about it. That’s why the world has ROM translations. So anyways, in Word Puzzle A, you choose a category, and you’re given a word in katakana, which you must decipher into its English equivalent. In its original form, this could be a nice little katakana primer for you budding first-year Japanese students. The problem is, it’s not intended for the English-speaking populace. So, sometimes you get the actual Japanese word in katakana, which has no relation at all to the word in English. At that point, you’re pretty much on your own. Word Puzzle B does away with the Japanese entirely and just gives you some blanks. 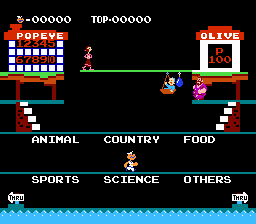 At this point the game just becomes Hangman with a Popeye theme. Yawn. Word Catcher seems to be some two-player thing that I have no idea how to play. 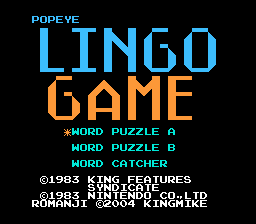 KingMike had to do some crazy fun things to translate this game, so the ROM must be expanded to 40KB before you patch it. There’s a text file in the zip named POPEXP.TXT that will walk you through it. If your patch doesn’t work, THIS IS MOST LIKELY THE PROBLEM. Everything was already in English except for those katakana words, so that’s done. Also KingMike made a new title screen. La! I’m not really seeing the point of a translation of this game, but KingMike did it, so hurrays go to him for it.